MILAN (AFP) -- Artist Christo’s floating walkway on a northern Italian lake has been closed at night because of wear-and-tear inflicted by the 270,000 visitors who have flocked to see it in less than five days. 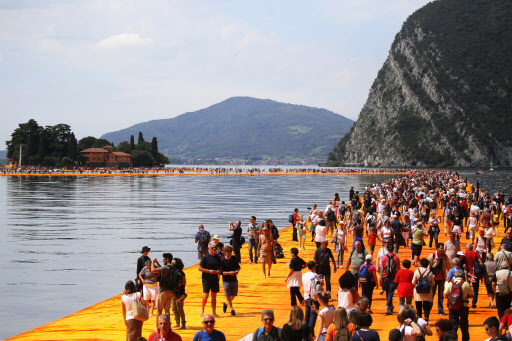 The 3-kilometer walkway of 200,000 floating cubes covered in orange fabric has proved a major hit with the public since it opened on Lake Iseo on Saturday. But plans to keep “The Floating Piers” open day and night until July 3 have had to be shelved as it is being worn out faster than expected, local officials said. The large numbers of visitors were also proving challenging for local authorities who have to keep the area clean, he said. The numbers of people who have come to walk on the free installation have far exceeded organizers’ expectations, who estimated around 500,000 would come over 16 days. Christo is famed for works on a massive scale, including wrapping the Berlin Reichstag in fabric in 1995.